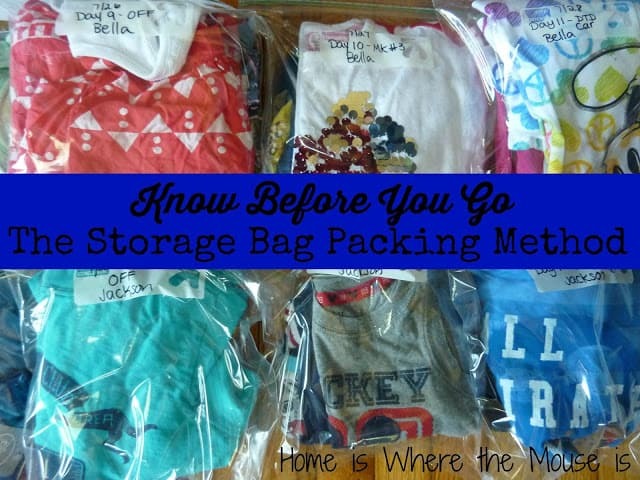 Packing for a long vacation, or any vacation, can be a daunting task. When taking kids along, that daunting task becomes even more difficult. Throw everything in a suitcase and you’re bound to forget something important. You’ll also be spending your precious vacation time rifling through your suitcase looking for a matching outfit. Over the years, we’ve perfected a method of packing that has kept us organized and helped us get up and go each morning of our vacation. The key to our success…a storage bag. Here’s our method. I am an uber planner. If you have read my 6 Steps to a Magical Disney Vacation post, you know how I like to plan out each day. I also plan my kids outfits around the park we’ll be going to that day or anything special we might be doing. However, you don’t have to be a scheduled as I am to use this method. Even the most laid back planner can benefit from packing their suitcase like this. The point of this method is to save you time. Instead of fumbling around looking for an outfit, you have it right there at your fingertips. Everything down to the accessories are laid out ahead of time so there’s no guess work. Start by purchasing a box of gallon-sized food storage bags. It’s your choice whether you want to buy name brand or store brand. Either will work. On slips of paper or post-its, write your itinerary. You can be super-scheduled like me and write exactly what you’re going. I write the either the name of the park or describe what we’ll be doing. If you’re more on the laid back side, you can simply label each paper Day 1, Day 2, Day 3 etc. 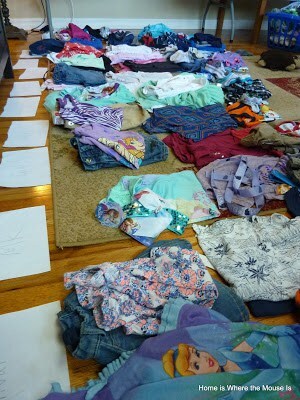 Next, I lay out the clothes for each day in piles, one for each child. 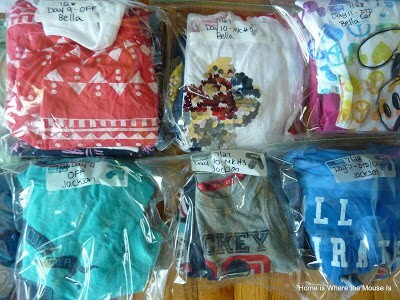 I include shirt, pant/shorts, underwear and socks. 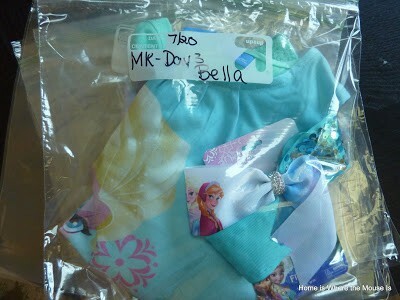 For Bella, I go so far as to put hair accessories in the bag. I then label each bag. Again, how you label is up to you. I write the date, destination and my child’s name. Fill each bag with the day’s clothes. Seal and press out any air. Now you’re ready to pack. Once we get the hotel, we place the bags in the dresser, in order. On the morning of, I get the day’s bag out of the drawer and dress the kids. This method really helps shave off some valuable time on our mornings. We know exactly what the kids will wear each day, so we can head out to our morning ADR or rope drop in a timely manner. Bella can now dress herself which is a big time saver. Having the bag ready helps her feel more independent. Jackson still needs some help, but which ever parent is in charge of getting him dressed knows exactly what he’ll wear. 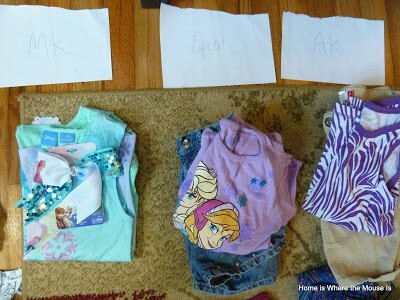 As you can see, with a little pre-planning, packing for your next Disney vacation can be easy-peasy. 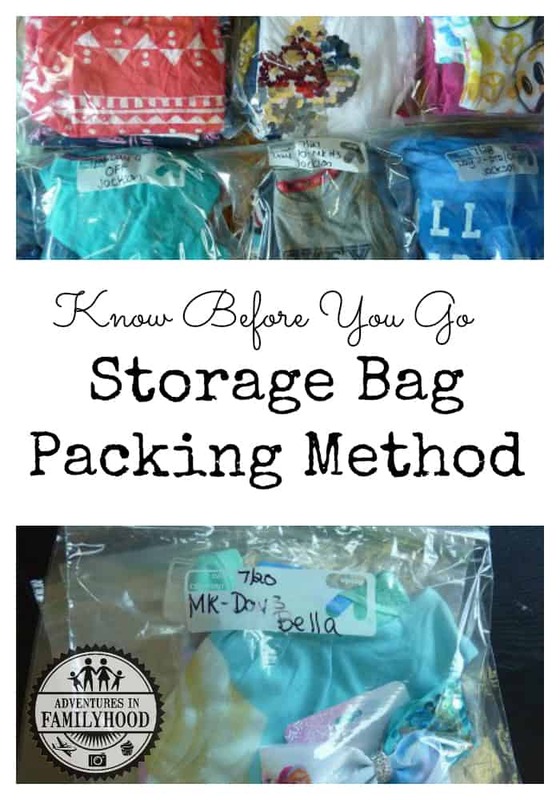 Have you used the storage bag packing method Let us know your experience in the comments.